John Falcone was born on October 28, 1939, in Boston, Massachusetts. He enlisted in the U.S. Marine Corps Reserve on Ocotober 31, 1956, and served as an infantryman with the 54th Rifle Company in New Castle, New Hampshire, until his discharge on October 30, 1962. After completing college, Falcone was commissioned a 2Lt of Infantry in the U.S. Army on February 3, 1963. He served in several stateside assignments and in Europe before being sent to Southeast Asia in May 1967. Capt Falcone served with Headquarters Company, 3rd Battalion, 8th Infantry Regiment, 4th Infantry Division in the Republic of Vietnam. He was killed in action on November 11, 1967, leaving behind a wife, Patricia L. Falcone, and their three children-Christopher, Martin, and Angella. 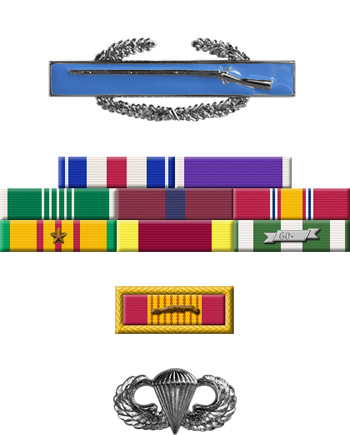 For gallantry in action against a hostile force in the Republic of Vietnam. 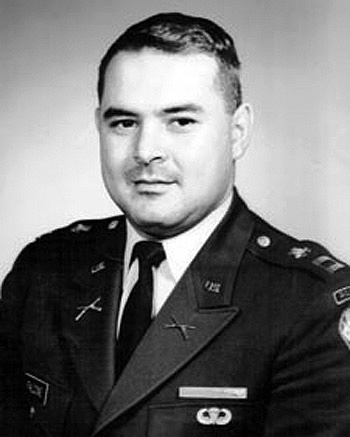 Captain Falcone distinguished himself by valorous actions on 11 November 1967 while serving as the Company Commander of Company B, 3d Battalion, 8th Infantry in the Central Highlands southwest of Dak To. Company B was being subjected to an intense attack by a large enemy force of North Vietnamese Regulars which was supported by mortars, rockets and automatic weapons fire. Captain Falcone immediately positioned his men in a defensive perimeter. He then moved to the company command post to direct and control his unit. During a critical moment, the command post lost radio contact with on of the platoons. With complete disregard for his safety, he left the command bunker and moved through the heavy enemy fire to personally give instructions to the platoon and to re-establish radio contact. He was then called back to the command post to coordinate the other platoons' efforts. He again braved the small arms fire and flying shrapnel as he made his way back to the command post and was mortally wounded. Captain Falcone's personal bravery and devotion to duty are in keeping with the highest traditions of the military service and reflect great credit upon himself, his unit and the United States Army.